Because this product is already discounted (See savings shown below), it does not qualify for any additional discounts. Higher Nature Immune + provides 1000mg Vitamin C (in two tablets), with Blackcurrant, Black Elderberry & Bilberry, plus Zinc, to prevent oxidative damage to the body. All Higher Nature Stock is obtained direct from Higher Nature. Why is this important? 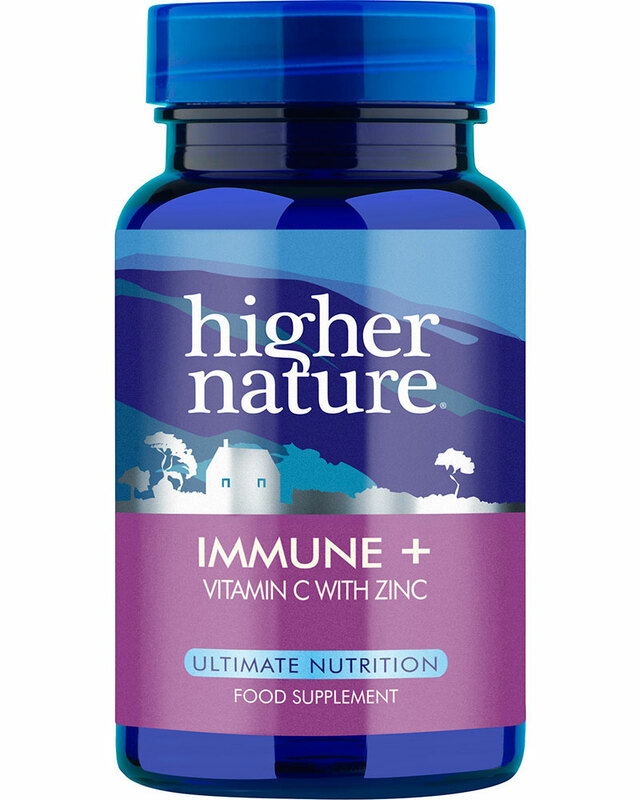 This high potency formula provides Vitamin C, with Blackcurrant, Black Elderberry and Bilberry, plus Zinc for added immune support. Vitamin C is a powerful antioxidant and supports healthy immune function. It is easily destroyed on exposure to air so, despite eating a balanced diet, we may not always be getting as much of this vital nutrient in our diets as we think we are. Zinc also plays a key role in immune function. Emerging research has found that the anthocyanidins and procyanidins found in Blackcurrant out-perform these compounds in other fruit, and not only protect nerve cells from oxidation but also help support the body’s defence systems*. *Reference Ghosh et al., (2006) Effects of anthocyanins and other phenolics of boysenberry and blackcurrant as inhibitors of oxidative stress and damage to cellular DNA in SH-SY5Y and HL-60 cells. Journal of the Science of Food and Agriculture. 86, 678-686. 1000mg Vitamin C, 5mg Zinc, 50mg Blackcurrant fruit 4:1 extract (min. 2% anthocyanidins), 50mg Bilberry standardised extract (2% anthocyanidins), 80mg Black Elderberry standardised extract (2% total flavanoids). Microcrystalline cellulose, hydroxypropyl methylcellulose, vegetable magnesium stearate, silicon dioxide. Take 2 tablets 1-3 times a day (children over 8 years, 1-2 tablets a day), with meals. An Advanced Nutrition Complex multivitamin is also recommended. More than 1000mg of vitamin C may cause mild stomach upset in sensitive individuals. Sugar, salt, wheat, gluten, yeast, lactose, dairy products, artificial preservatives, colours or flavourings. Higher Nature is a company that was founded on a set of principles and a vision to provide high quality, well-researched nutritional products. This British, independently owned business was the brainchild of pioneering nutrition experts, Brian and Celia Wright, who wanted to make a significant contribution to the health of those using their supplements, through active ingredients at levels dictated by scientific evidence on safety and effectiveness. They would not market a product, even a bestseller, if they were not convinced that it was beneficial to health. In today’s age of ever-increasing competition and following the sad loss of co-founder Celia Wright in February 2009, it would be very easy to abandon those values, but not Higher Nature. The company continues with the same inspiration, principles and dedication to health. David Coulson joined the company as both new CEO and investor in December 2010, marking the start of the next stage in the journey. Higher Nature is committed to providing our customers with the best, natural and most effective supplements for optimum health and to supplying these to the highest standards of service possible. The Company aims to make a significant contribution to the health and wellbeing of those who use our supplements, to support retail health stores and health professionals, and to run a healthy and happy, equal opportunity business with satisfied employees and shareholders. We also aim to educate and affect attitudes about nutrition and health more widely. There is no doubt that companies and practitioners in the health food sector have faced difficult trading conditions in recent years, and Higher Nature is no exception. However, the company has by no means stood still during this time and has continued to innovate and invest. Product development has taken place, with several new launches in the last few years. We have also developed our online capabilities and in 2010 launched www.nutripeople.com, a fantastic source of free nutrition advice which acts as an education academy for consumers, trade and practitioners. It works as an independent health guide, allowing people to search for information about health conditions and nutrients, and to seek professional advice where necessary. Higher Nature has a team of fully-qualified nutritionists and other experts in the field, who pull the information together using their specialist knowledge. In 2013 we launched The Higher Nature Academy an online educational tool to help anyone with an interest in nutrition. In 2014 we launched our new responsive websites to make it easier to view and order our products regardless of the device being used. We remain privately owned, we are investing in the business, and have plans in place to develop our premium brand within supplements and foods and to increase retail distribution to reach a wider consumer audience - in short there are plenty of great opportunities ahead and we are ambitious and optimistic about the future. At the centre of this is our loyal, knowledgeable customer base, which is why our focus on customer service will remain as high as our focus on providing unique, ethical and effective supplements under the Higher Nature brand.